Meeting these things is far more thrilling than the zeroes on its HP bar. Final Fantasy's hardest bosses are usually hiding somewhere, waiting to wipe out your party immediately. 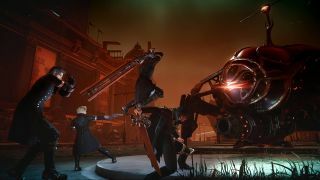 For Final Fantasy 15's PC release, the developers added a big spider robot called Omega, which is buried in a part of the Insomnia city map near the close of the game. It's described as a weapon forged to fell the gods—and when I ran past it on my way to another objective, it wiped out a party member's health in one hit. I haven't beaten Omega, and I'm not sure I ever will. Final Fantasy 15's combat doesn't demand enough strategy to make for interesting boss fights, only long ones—exemplified by the slog that is the battle with mountain-turned-angry-turtle, Adamantoise—but in some ways the effect of knowing it's there is the best thing about Omega. That part of the city is no longer safe. It's ready to kill me. This has always been the case with the 'Weapons' and superbosses from Final Fantasy games of the past: they're usually giant horror creatures, representing the game's ultimate challenge. It's not the idea of a long boss fight that's exciting to me—it's how they're presented. Final Fantasy 10 was the first entry I played, back in 2002—I've since played them all. I'd gotten pretty good at the game's complex progression system and learned how to take down every boss quickly. It's not a hard game, as long as you don't skip random battles and keep your characters developing—but then I returned to Besaid Island, one of the game's opening areas, and met my first Final Fantasy superboss. You can see the scene play out above: the sky changes colour, a bald man screams 'infidel!' and a dark version of one of your summoned allies arrives to demolish your party. It's actually a bit spooky. Or at least, it seemed that way when I was 14. That almost horror movie-like reveal technique is used in a few other Final Fantasy games, too. One of the most memorable for me is Ultima Weapon in Final Fantasy 8. You fly to an area known as the 'Deep Sea Facility', mysteriously placed in the middle of the ocean as a secret dungeon for the player to find. Once you reach the bottom of the facility, things get more bizarre: an alarm goes off, the rocks resonate and this thing suddenly attacks. The build up to the boss and the eerie sense of place is what makes it a great boss fight—not the fight itself, which is pretty easy if you've got Squall levelled up appropriately. Check out Bizkit047's video below to see what I mean (note: Squall has been renamed 'Kevin'). Go, Kevin, go! This is why I'm a big fan of Final Fantasy's superbosses. They're endgame content, not tied into the main story, so they offer value to keep playing after you've seen the credits—but the developers clearly think hard about the way such enemies are introduced, and what kind of atmosphere their presence creates. Omega is just the latest in a long line, and I love the way it's explained as a god killer, created by man. I can't be bothered to fight the thing, sure, but it's a cool explanation for why it exists. Final Fantasy 7 has arguably the spookiest superboss of all: Emerald Weapon. Even though the game's dated visuals mean the creature doesn't have the same impact that it used to, this thing swims around the world's dark oceans, and can only be encountered in the submarine you obtain deep into the game. Sometimes it'll just hover right in front of you, and its location will be revealed by little bursts of air coming out of its sides, emerging from the dark. Like most Final Fantasy superbosses, it'll pretty much kill you in moments unless you've mastered the game's combat and progression systems. Why did I ever think this thing was scary? Final Fantasy has many obvious traditions: chocobos, cactuars and a guy called Cid all spring to mind. But this is probably my favourite. I love the idea that mastery is hard fought in Final Fantasy, and that there's always the chance there's something else out there in the world, waiting to murder your party.